The NS Strap System is a moving experience guaranteed to make you smile! The freedom of full mobility, only a dream for the cellist or upright bassist, is now a reality. 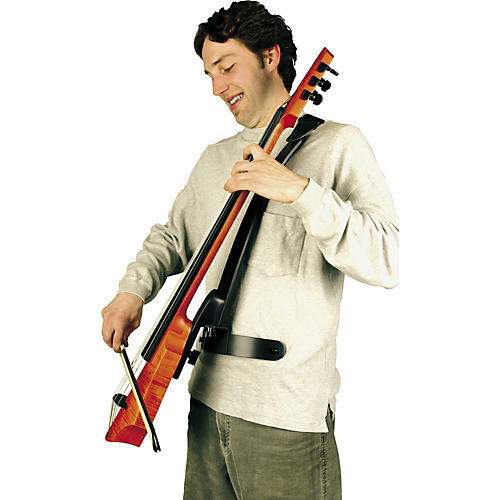 The NS Strap System fits over the shoulder like a guitar strap, but holds the instrument out from the body in the ideal position for bow and pizzicato technique. Virtually all traditional playing techniques are possible, including thumb position. The instrument neck is tilted back and close to the shoulder, but the body angles out, away from the body for excellent bow access across the full arc of play. This angle also helps traditional cello and bass pizzicato technique to sound and feel natural.